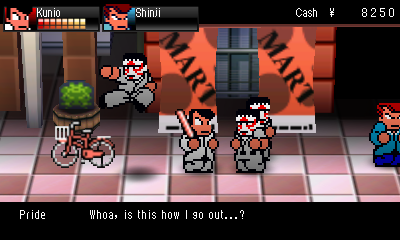 River City: Tokyo Rumble, from Natsume, is the latest game in the Kunio-kun series. For those unfamiliar, the series consists of Renegade, Super Dodge Ball, River City Ransom, and loads of other games, most of which never made it out of Japan. The new game is a proper sequel, starring the hotheaded Kunio and his band of ne'er-do-well friends as they tear it up in Tokyo, fighting kids from rival schools and eventually taking on a series of street gangs. Just like River City Ransom, the game takes place in a world made up of freely accessible interconnected areas, and beating up enemies earns cash that can be spent on health restoratives, stat-increasing clothing, and new combat moves. Aside from basic punching and kicking, the player can learn more than a dozen new moves during his face-punching journey. While the main game is single player only, players can fight alongside one of several AI companions, and there are download-and-play versions of free-for-all brawling and dodgeball that allow up to 4P competitive action. The game is a 3DS exclusive and is now available via the eShop, as well as in physical form. Check our coverage here.